Log in with your username and password . Navigate to the “Plugins” sub menu. On the “Plugins” sub menu, click on “Add New”. In the “Search plugins…” box, type in “All-in-One WP Migration” and press Enter on your keyboard. 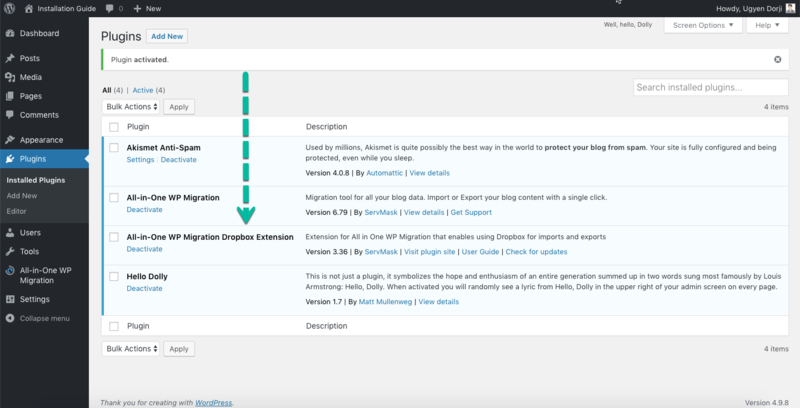 Install the All-in-One WP Migration plugin by clicking on the “Install Now” button. The installation process is quick. Once it has changed, click on the “Activate” button. You will get a notification that states, “Plugin activated”. You will see the new plugin in your list of plugins. Download the Dropbox Extension from the link in your purchase confirmation email. Click on “Choose File” to select the .zip file that you downloaded from the email. Once uploaded, click “Install Now”. Congratulations. You have completed the install process and can now migrate and backup your website using the Dropbox extension.